Patient who suffer from hyponatremia may appear asymptomatic or suffer from headache, nausea, malaise and vomiting. If the sodium level is less than 120 mmol/l , patient is at risk of developing seizures, absent of reflexes, coma or stupor. Pseudohyponatremia may occur in cases of hyperglycemia with high level of protein and lipid. The common causes of hyponatremia are divided into euvolemic hyponatremia, hypovolemic hyponatremia and edematous hyponatremia. 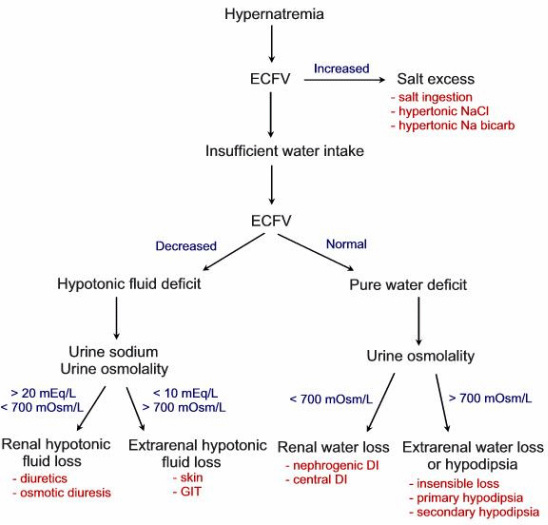 Edematous hyponatremia is related to nephrotic syndrome and cardiac failure. Water overload, endocrine disorders and syndrome of inappropriate ADH secretion may lead to hypovolemic hyponatremia. Syndrome of inappropriate ADH secretion occur due to head injuries or tumor which is known as intracranial disease., intake of drug such as carbamazepine and lung disorders such as lung cancer and pneumonia. Drinking excessive amount of water, intravenous infusions and transurethral resection of the prostate or TURP syndrome may lead to water overload. 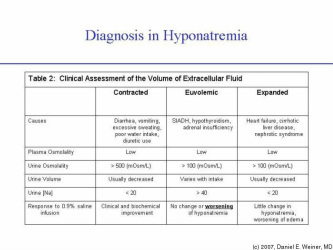 Endocrine disorders such as Addison’s disease or hypothyroidism may also cause euvolemic hyponatremia. Hypovolemic hyponatremia may occur due to loss of renal sodium as a result of renal failure, hyperglycemia ( osmotic diuresis) and diuretics. Gastrointestinal losses due to paralytic ileus, obstruction of the small bowel, fistula, vomiting and diarrhea and other causes of loss of sodium such as peritonitis, crush injuries, ascites and burns may lead to hypovolemic hyponatremia. Central pontine demyelination may occur as a result of rapid correction of sodium level with intravenous sodium chloride. Rate of correction should be done in a great care. Hypernatremia occur when the sodium level is more than 145 mmol/l. Initially patient may complain of thirst if the sodium level is around 148 mmol/l- 151mmol/l. Central nervous system disease may lead to lack of thirst in hypernatremic patient. If the sodium level is more than 158 mmol/l, patient may present with rigidity, muscular tremor, seizures and coma. The common cause of hypernatremia is loss of renal water. This occurs due to congenital diabetes insipidus,nephrogenic diabetes insipidus( Bence Jones proteins, lithium, acute tubular necrosis recovery phase and obstructive uropathy post - relief) and hyperglycemia (osmotic diuresis).Excess sodium due to steroid therapy, intravenous sodium therapy, Cushing’s syndrome, cirrhosis of the liver , congestive cardiac failure and Conn’s syndrome( primary hyperaldosteronism) may also cause hypernatremia. Hypernatremia may also occur due to water loss as a result of burns, pyrexia and vomiting or diarrhea due to gastrointestinal loss. Confusion or coma may also cause hypernatremia. It is advisable to avoid any rapid correction of hypernatremia as it may lead to cerebral edema. The investigations required are CT scan of the head for detection of any trauma or tumor causing central diabetes insipidus, urinary osmolality to differentiate between nephrogenic and central diabetes insipidus and urea and electrolytes ( Na+ > 190mEq/l due to salt ingestion for long term. Na+ 150-170mEq/l due to dehydration and Na+> 170mEq/l due to diabetes insipidus.